Jose Antonio Pott was born in Kingston, Jamaica on November 23, 1970 to Jennifer Webb Graham and Gregorio Feliciano Pott. He is brother to Roberto, Natalie and Omar. Husband to Samira, father to Jodi, Samron and Sakir. Friend and family member to many. It is impossible in only a few minutes to fully convey the essence of a man, but I will try. To capture for example: the loyal son, the devoted father, the loving husband, the endearing sibling, the considerate friend, the thinker, the great conversationalist – the compassionate soul. This afternoon in this spiritual space we come to celebrate this natural mystic flowing through the air, a roots man with a vibration who made all our lives better. In 1978 when Jose was eight his family migrated to Belize where his father, a medical doctor, came to work. The family went to live on Regent Street near the Mopan Hotel. In 1980 they moved to Belmopan, where he spent his primary school days. Jose came back to Belize City to study at St. John’s College and Junior College. Jose grew up with a strong rural connection. In Belize it was his father’s family village, Maskall, where he embraced the “plantaish”, taking pleasure in the pastoral life. On his mother’s side he was exposed to the Jamaican countryside, especially from his grandpa Manley. In Maskall, Jose once slow walked for two hours with his Grandpa Julian just to get permission to gain a short ride on one of his horses, packed down with corn. A little ride to a field across the road. Jose loved horses. This type of experience cultivated in Jose a roots man essence. Jose was the leader of the pack to his siblings. Of course, coercion was just one of his tools from a very young age and he wasn’t above goading them and peers to jump off the rock at Cave’s Branch or going into the haunted house on Regent Street. Jose led from the front, fearless, like the time he directed Roberto to jump off a groin at Montego Bay. And later in his life, he inspired his son Samron, to the dismay of Samira, to jump off a waterfall in the Toledo District. Jose admired his Dad and it is likely that he developed his love for music and appreciation for reading from Gregorio. Jose’s love of music reflected an eclectic taste. He found solace in reggae music and many other non-mainstream genres. He was always there to provide music for family celebrations. Jose shared the science behind music and the impact it has on one’s mood. Of course, we had to endure his heavy metal phase, especially since that type of music is best at its loudest. Music was a way he expressed himself – a wonderful celebration of the human spirit though sound. Jose Pott was a humble man who effortlessly interacted with all people. He felt comfortable and compelled to speak to people wherever he went. Whether it was an intellectual or someone without formal education, Jose always preached that “over-standing” was not only for the elites. Jose was always willing and prepared to debate politics, world events, religion and philosophy, ideas encouraged in his family home. He developed a strong sense of social justice and a duty to always fight for the underdog, and to stand for what is right and just. Some considered this contrarian side of Jose as confrontational, but his non-conformist way of proceeding in the world sprang from his clarity for goodness and fairness in life. There is a special way that I think about Jose’s beautiful mind. It was provocative, mercurial and rich in spirit. Even in disagreement you would see his magnetic smile radiate, advocating his position to a more agreeable place. So in a strange way – even if you disagreed with his position, you could never disagree with him. Jose was a deeply spiritual man. He read and studied all kinds of religious writings, but it was the way he conducted his life, caring and interested, that we will all forever be blessed with. No matter what you had to say he would always be prepared to listen. My few minutes with you this afternoon could never be complete without my describing an incredible love story. Samira and Jose spent almost thirty years together. Their courtship with its origins in high school created a tight connection to the heart very early. Jose loved sports – tennis, cycling, football, and it was on a tennis court that he had his first encounter with Samira. Their first rally lasted thirty years. The Jesuit priest, Fr. Synders, who counselled Jose in high school, referred to his character, as an “imitable smile, a little spark of God’s beauty, a handsome boy.” The love and friendship between Samira and Jose stood the test of time through junior college, though the long distance when Samira went off to study law. It was all before the internet and Facetime, so the sound of each other’s voice had to be the delicate chord that kept the fire of their love burning. Jose was an outstanding father. He and Samira brought three beautiful children into this world. None of them arrived with an instruction manual, but Daddy Jose made sure he studied and researched how to be a good father. I know we all agree that he needed no lessons in parenting for his character made him such a natural. He was there, and that is the beginning and the end of everything. He was there for them. His courageous daughter Jodi says, “I love when I danced with my dad especially to the song ‘My Baby’ from Mark Anthony.” And she too loves music; this is the magic of family, the flowering and the blossoming into the special garden of the heart. Jose was always so proud to ask me about Samron at SJC. Only recently when playing table tennis Samron told me with such pride and joy how he would go riding with his dad. Jose spent a lot of quality time with his youngest, Sakir, taking him swimming at the pool, taking him to the park, and lying with him in the hammock at home having their little chats, testament of what a devoted, hands-on father he was. Jose taught his children to respect their elders, by example. He told them, “You don’t have to please anybody but God.” The trait that was most important, the one he held in the highest was integrity – being true to the commitments you make. There are melodies pure and true that Jose would want us to remember. 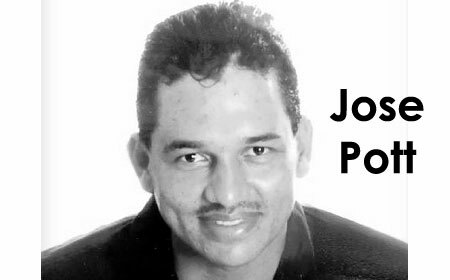 There are countless songs that when we hear them, we will remember Jose’s voice. Jose and Samira’s three little birds…arms stretched across time and space…a family in love…where the spirit light always comes home with hope. And somewhere Jose Pott is singing: Don’t worry about a thing, ‘cause every little thing gonna be all right. Just one day after his father passed 13-year-old Samron posted these incredible words: “Unruly Don You gan lee bit too early fih Mih, but you the rest You teach me the values of life and that I will always cherish I will always remember all the memories , and you will always be in my heart Rip Dad you’re in a better place now and u don’t need to worry me, Jodi, Sakir and mom, we will Always stick together and have you in our hearts. Goodbye Jose – fundamental goodness – son, brother, husband, friend, father – It is time to rest! Go rest in peace.